Why look for the best welding cart when you can choose randomly? Moving around machines and appliances used for plasma cutting and welding during work can be somewhat unwieldy. While there are some tremendous portable plasma cutters available, it’s still much less strain on the back to move them around using a welding cart. With the help of a cart, you can quickly move things from one place to another without causing yourself a backache. If you don’t know where to look and what to look for, you’ve come to the right place. After our thorough research based on product reviews and customer demands, we’ve compiled a list of the best out there. 5.1 1. What is the purpose of keeping the top shelf of almost every welding cart angled back about 10 degrees? 5.2 2. Do the front wheels of a cart swivel to make them steerable around the shop? 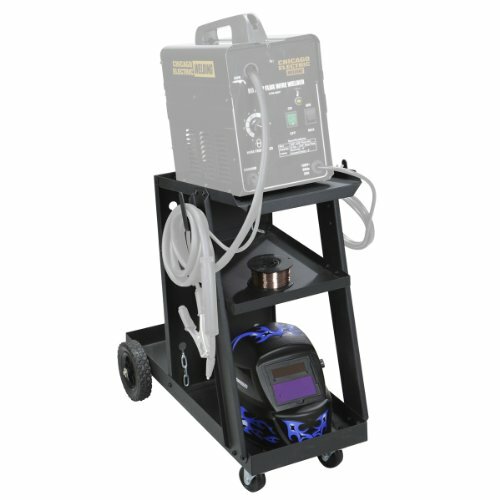 Before you go purchase a cart, you need to know what a good welding cart looks like. So, what do you need to look for? Firstly, a good-quality cart must be large enough to accommodate most of the available welders/plasma cutter models available in the market. Additionally, it should consist of a storage tray where different accessories and other smaller equipment can be stored. Subsequently, its durability and strength must be ensured. That is to say; a good welding trolley must be constructed of durable materials to contain heavy items. Besides, always look for a cart that features hard rubber wheels. Even though the size of the wheels is a negligible factor, consider buying carts with larger wheels to provide more portability and ease of access. Last but not least, it has to meet your budget. 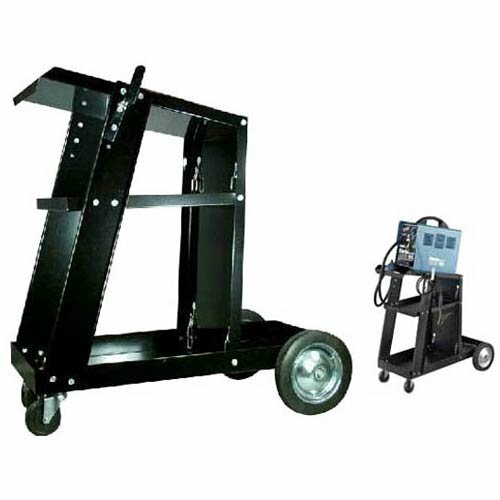 A good welding cart is usually available within $50 to $100. Note that your budget is a crucial factor if you’re worried about how much spend behind a good cart. However, if you’re looking for a good design accompanied by desirable features, you have to go for an expensive model. To sum it up, a good quality welding trolley should be sized ideally to fit most welders and cutters, be made of strong, durable materials, and constitute a storage tray for accessories and smaller equipment. After deciding your criteria, you may want to have a look at the list of top picks we prepared just for you! Now that you know what the features are you should look for, let’s not delay any further. Without beating about the bush, here’s a list of our top 8 picks. Available at a very affordable price, this cart is effortlessly one of our top picks as one of the best plasma carts. Consisting of 3 separate levels, this cart provides plenty of storage facilities. This means you can easily organize your tools and accessories with no space deficiency to worry about. It also has a raised handle for the ease of pulling and pushing. Hence, you don’t have to worry about its maneuverability. The top shelf is slightly slanted, accommodating most welding equipment and keeping welder controls at an easy-to-use angle. It also has hooks to store torches and other pieces. A chain in the back keeps the gas tank in place. Note that the cart can hold both a welder and a plasma cutter. On the flip side, this cart will not be suitable for heavy-duty industrial use. Besides, most users will have difficulty following the poorly-written instruction manual. However, this product will be on your top pick for the overall feature that it has to offer. 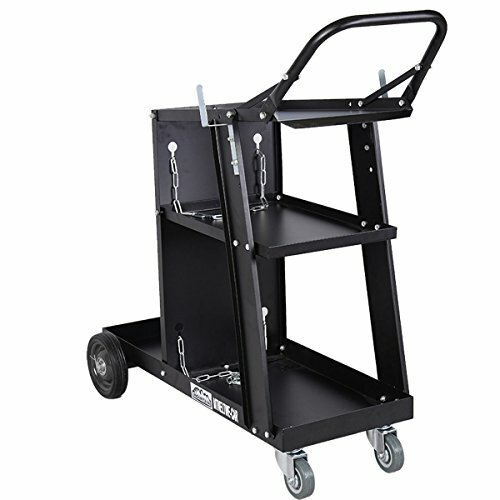 According to most customer reviews, this is the cart that would meet your DIY needs perfectly. This easy-to-assemble cart is available with caster front wheels of 3 inches that enable you to maneuver with ease. The back side of the cart consists of fixed rear wheels that fix the wagon in place during cutting or welding. Materials such as large welders, helmet and other accessories nicely fit here. This cart also consists of a separate shelf for storing accessories. The chain on the back of the cart holds gas tank in place. However, the primary disadvantage of this product is that the handle of the cart mounts on the inside. This often disrupts welder placement. Regardless, this cart is still one of our top picks for the plethora of facilities it provides to a user. This MIG TIG is one of the most affordable carts available. Additionally, this cart features everything you’d want in a good welding cart. Make sure the cart is assembled correctly because when so, it is very sturdy and stable. This is an important point to be noted because not all plasma cutters are as reliable as this. While discussing the size, this one can be referred to as a medium-sized cart. That is to say; other carts are much smaller in size while some are much larger. This cart is rather specialized for storing heavy-duty materials. This means it can hold MIG, TIG, Arc welder or plasma cutter. It provides plenty of space to store all your necessary tools. It also consists of a rack for storing your cylinder along with a storage tray. 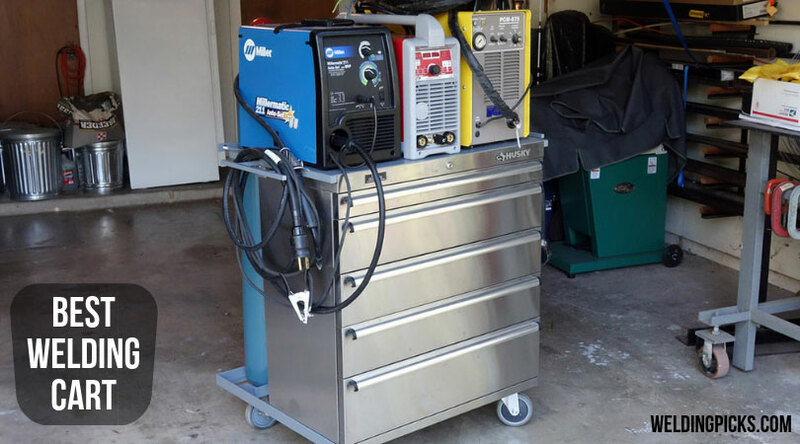 This cart holds a welding machine along with a dozen other tools and accessories correctly. It is vital to consider that this cart may not be suitable for large tanks or extra-large plasma cutters. Besides, the instruction manual is not very well-written. However, most people should be able to assemble this cart without much problem. Although the absence of an instruction manual proves to a disadvantage for this product, this is an excellent cart for its price. The main frame of this machine cart is made of high-quality, durable steel. It is one of the long-term products you might want to use. With a sturdy and robust build-up, this cart has an efficient loading capacity. Moreover, this cart is easy to assemble which comes with the right guidelines. It is a three-tier tray that provides ample space for storing all your tools and equipment. The cart has two casters and two wheels on the backside. This means it can be easily pulled or pushed with the top handle despite the presence of heavy materials on top of it. Therefore, it’s very suitable for home use as well as for most MIG machines and plasma cutter. However, according to a few customer reviews, the cart should not be used with anything above 40 cu/ft. bottle lest it should make the cart unstable and tipsy from side to side. A few minor issues like these aside, this is a great product that you can choose for keeping your welding equipment. Adding a fine finish with heavy-duty steel construction, this cart is both rust and corrosion resistant, making it suitable for providing a long term use. So, if you’re looking for something that will go a long way, this might be your top choice. 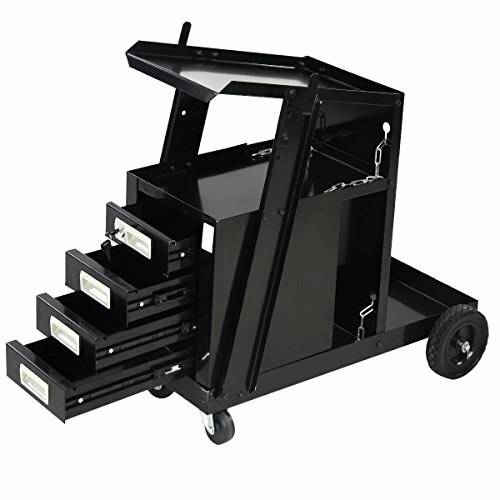 The cart also features a 3-tier storage tray that can provide ample space to store tools and accessories. Furthermore, it also consists of two chains to secure the gas cylinder. Besides, it is equipped with 360-degree tough front caster wheels that are easily maneuverable. Consequently, the two large rubber wheels on the rear side add stability to the cart. It also features a top handle that can be handled with ease. However, the fact that the packaging does not come with a manual is a primary disadvantage of this product. But overall, this is a cart suitable for both home and garage. 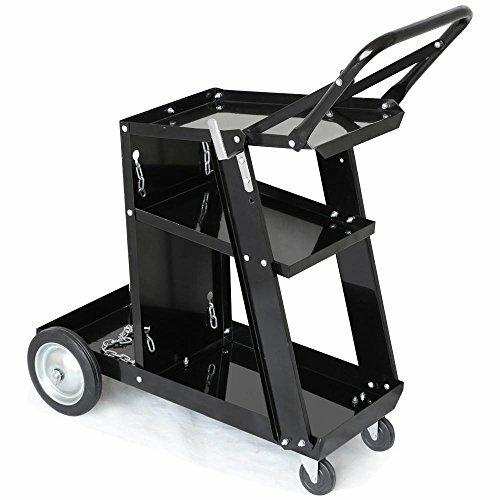 This machine cart is made from sturdy steel and is easy to assemble. The top shelf is slightly tiled for easier access to welder controls. For extra storage, the cart includes two additional shelves below the welder shelf. Additionally, it consists of two chains to secure the gas tank and has a hook for the torch assembly. This cart can handle anything between 1/4’’ aluminum to 3/8’’ mild steel. Since the cart is relatively small in size, it will not accommodate a plasma cutter or a welder. Otherwise, it is a rather handy cart suitable for home shop users. As a final thought, we’d say that this cart does a reasonably high performance for a cheap welding cart. This cart is easy to assemble and comes with a well-engineered design. Safe to say it has the best welding cart design. The steel handle makes the cart convenient to maneuver. Since the cart is made of sturdy steel, it is rather strong and durable. It is also very robust. Two attached chains let the cart secure the gas tank. The cart also features an extra storage tray. A minor disadvantage of this cart is that it comes with very poor assembly instructions. Additionally, this is not suitable for holding both the plasma cutter and welder on the same go. However, in terms of style along with efficiency, this would be your go-to-product given the number of facilities it has to offer. Also, since this cart is easy to assemble, the lack of proper guidelines should not be a problem for most users. The Goplus is built from sturdy steel construction with a durable black finish. This ensures its use for a long time while the finishing enhances long service delivery. Additionally, this cart consists of separate drawers which lets you store and arrange your tools and supplies according to your convenience. The storage tray can hold other tools and smaller equipment. The front and rear wheels are designed to facilitate easy maneuvering. 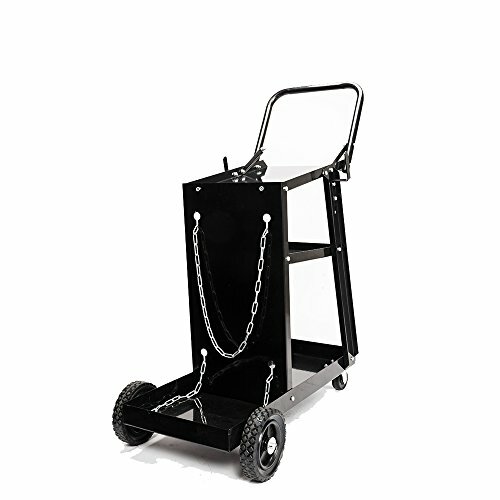 Besides, this is an extremely heavy-duty cart suitable for both home and workshop purposes. If you’re looking for a large cart for professional purposes, this would be your pick. Even though it does not include any assembly instruction, this is overall a great quality cart that will go a long way. If you think you can assemble this product all on your own since this is a product that’s pretty easy to assemble, go for it! There are different types of carts based on the number of shelves they have, the configuration through which they’re built, etc. 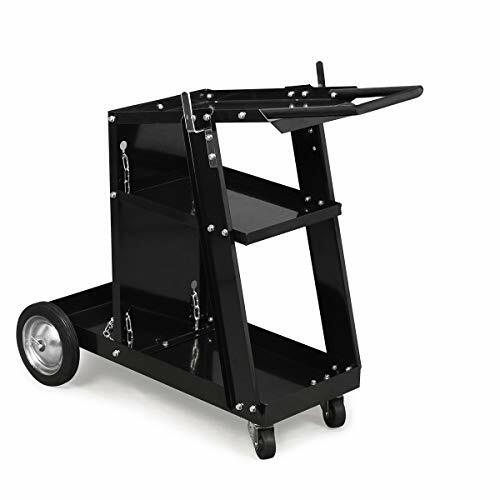 It’s important to identify what type of cart you needed storing your tools and accessories. Some DIY carts may consist of a single shelf. These shelves are suitable for home purposes only and storing small tools and machinery. You may also find carts that consist of two shelves. These are relatively larger than single-shelved carts and provide much more space for storage. Most of the products we have reviewed in this article consist of 3-tiered shelves. Yahateech and Rovsun are some popular choices. These carts deliver ample opportunity for storing all your necessary tools and organizing them accordingly. Some of the carts like the Goplus have stepped up the game by featuring 4 separate drawers for storage. For storing heavy-duty materials and machinery, this type of cart could be your best choice. Below are the perks and downsides that come along with a cart. It’s better to learn about the pros and cons before you invite one into your workshop. A welding trolley will save you the trouble caused by carrying heavy machines like a welding machine here and there. As a result, using a cart will minimize user fatigue and health problems associated with backing pain. The easy portability of a welding machine lets the user move efficiently at the working site. Most carts are easily maneuverable. And, all the products we have reviewed here consist of this quality to ensure ease of accessibility. 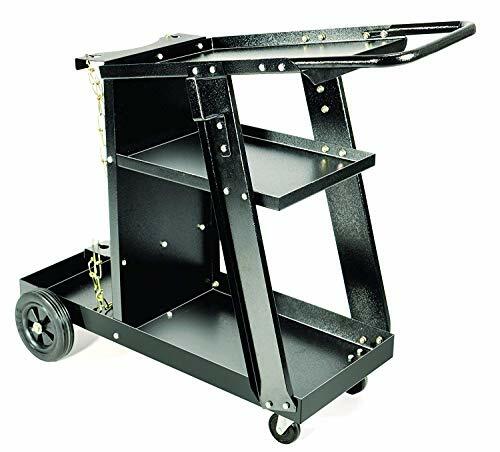 Using a cart makes it very easy to carry other essential supplies, tools, and machines you may need to use occasionally. Most of these carts provide service for a very long period. Hence, for your day to day use, these carts can prove to be very useful. Investing in a good cart is one of the things that can make your life a lot easier. It’s a small price to pay for something so efficient. While the advantages of these carts are in numerous, many of them come with a poor assembly instruction manual. This makes it difficult for the user to navigate. In some cases, these carts do not come with an instruction manual at all. 1. What is the purpose of keeping the top shelf of almost every welding cart angled back about 10 degrees? The angle allows the operator to get a better view of his tools by providing a straight-on view. This enables the operator to see his machines even from a distance. Simply put, your tools are better viewable from a tilted angle. 2. Do the front wheels of a cart swivel to make them steerable around the shop? If you are a frequent user of welding tools, it is an absolute must for you to have one of our reviewed products. We aim to let you know about the best welding carts available in the market through our rigorous research on each of the welding cart reviews mentioned here. Depending on your personal needs, you may go for any of these products and rest assured, you will not be disappointed. Happy buying!